페니케, 포르투갈의 H2O 서프가이드 호스텔 | 호스텔월드에서 예약하세요. A suite with double bed, wardrobe, private bathroom and private terrace for your peaceful moments. A twin room with two single beds, wardrobe and view to the garden. A quadruple room with two bunk beds, wardrobe and terrace where you can relax under the sun. chill on the sofa or on the super comfortable XL puff and hammock, enjoy meals on the long dinning table. There is also a full equipped kitchen to store the food and for self catering. the wetsuits room with shower to wash and dry your wetsuit, bathroom, toilet, barbecue and an outside area with garden to unwind. 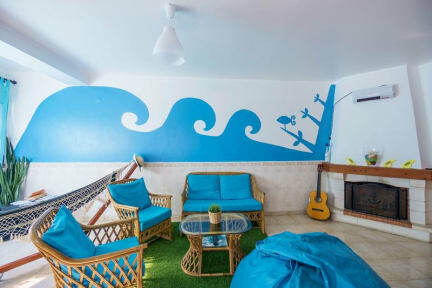 The hostel is 300 meters away from the beach and has free internet WIFI connection. Sheets and 2 bathroom towels are provided on arrival.